Mudjin Harbor in Turks and Caicos was my first sea glass hunt and it was amazing. in about an hour my husband and I found about 70 pieces of keeper pieces, many more were tossed back. 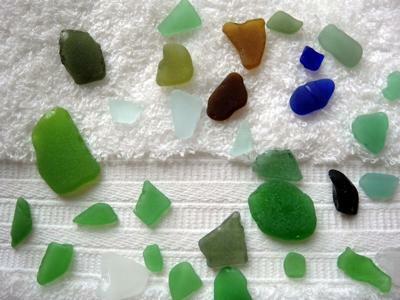 The majority of the glass is green, but we found some white, aqua, olive, lime, turquoise, cobalt and a piece of yellow. just about all of them are 1/2"- 3/4". Until I read this website I didn't realize how blessed we were. The day we went was a day that hurricane Katia passed offshore and since it was hurricane season, it was the low season and the beaches were basically empty, probably not searched for a while. The instructions to go to the back of Ron Jon were excellent. 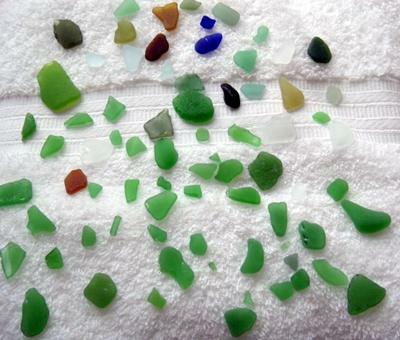 Didn't have much time to look for sea glass but did find some. I was a happy girl. Didn't have time to look for conch or to go to the farther side of the beach. Beach in Turks and Caicos where Carnival ties up. Go through the shop on arrival and to the right of the pier, behind Ron Jon's I found a lot. Also about 1/8th of a mile down before the bend the beach is littered with conch shells that have been discarded. 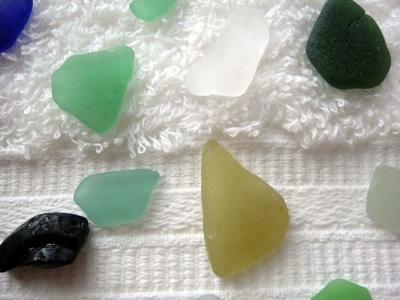 I was sent down their to get shells and found the beach littered with sea glass. Conch shells, REALLY! 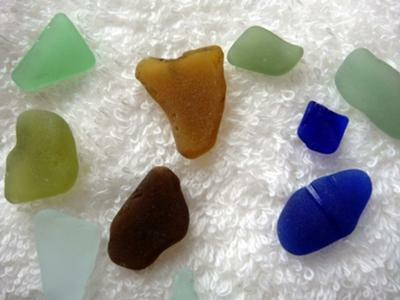 What about the sea glass. I started looking on the beach side to the left and found about 40 pieces in two hours of watching the surf. Then I was told there were conch shells to the right. Well I walked down the beach behind Ron Jon's and found about 50 pieces in less than an hour. GREATES HUNTING I've ever had. Greens and browns and only two blues and a few clear.